Karl says Izzy has told him everything, and there are things she doesn't know. Susan says yeah, like what?' but Karl says it's none of her business. SUSAN: Did she tell you she loves you? Did she tell you she'll *always* love you? Did she threaten to harm herself? Karl says she didn't and Susan supposes it was just another lie then. SUSAN: God, it must have been spectacular! Karl says he would appreciate if she just left it alone, Izzy's suffered enough. SUSAN: Oh has she? So once again Isabelle is the victim in this. KARL: I'm going to put your hostility down to ignorance. SUSAN: That's just fine Karl. What do I put your ignorance down to? She leaves, and there is a shot of Izzy in the bedroom, looking shaken. Annalise is interviewing Toadie, but when she asks about the Kennedy divorce, he doesn't want to talk about it, even though she keeps pushing him. She agrees to finish the interview later, and Toadie gets up, only to be attacked from behind by … Darth Vader? In Erinsborough? *shrug* Mr Vader speaks in a Mr Vader-type voice, and waves his light-sabre around, until Toadie uses a wrestling move on him. Annalise is capturing all the action, as the true identity of Darth Vader is revealed – it's Lance! He and Toadie have a cuddle, and Annalise films, smiling. Lance is in town for a Deep Space Nine convention, but he heard about the Doco, and didn't want to miss the chance to get his face on telly! Lance tells Toadie about the comic book conventions he runs with Alana, and says he will be sticking around long enough to re-live a few of Number 30's finer moments. Toadie tells him it is now called the House of Trouser, but Lance says as long as there is mould in the fridge, and stains on the couch he'll be a happy little Jedi. Yummo. Lucy asks Paul why he kept after Lil when he knew she was married – and she never knew there was a kid involved! Paul says it seemed like a good idea at the time. Lucy asks if he still loves her, and Paul says no, he hates her! LUCY: How can you say that when you're so obsessed with her?! Lucy asks when was the last time he called his kids? Paul rattles off the occasions when he calls them, but says they hardly speak to him, and they all hate him. Lucy says that Lucinda misses him the most, but Paul says she's never even around when he calls. Lucy replies he isn't exactly the stable father figure, and it is less painful to cut him off then to have her hopes dashed again and again. She continues, saying that once he gets the check from Rosemary he'll just take off again – but would it kill him to buy a place and settle down for a while? Izzy brings Karl a cuppa, and climbs into bed. Karl can't figure out why Susan has to keep interfering, but Izzy says she didn't know the whole lie story, and maybe it would be different if she did. Izzy points out that it's not Susan he is angry at, and Karl replies she should have gone to the Police. Izzy turns on the tears, telling Karl she wanted to turn something horrible into something good – they would have made the best family…and even after she died, the risk of losing him was too high – she couldn't risk it. Kayla is nursing a crying Ashley, when Steph comes out. She jokes that Kayla should put Parliament Question Time on – that would get her to sleep! Kayla asks if she woke Steph (ahh…the fact she is still fully clothed should have been a pretty big hint she wasn't asleep, dude…), but Steph said she just heard the washing machine finish, and she'll go put the stuff in the dryer. Kayla says she'll do it – she's up anyway. Steph asks where Boyd is, and Kayla says he's asleep – Steph says typical male…just when there's work to be done – but Kayla says he has heaps of school work at the moment. Kayla says she doesn't know many people who would do as much as Boyd does for their own kids, let alone someone else's. Steph says that's one thing about Boyd – when he commits, it's 100%. But then, doing the hard yards is all just part of it when you love someone…Kayla looks uncomfortable, and suggests to Ashley that they try laying her down again. Steph and Kayla watch her lay there, and Steph comments about how beautiful she is. She asks if she looks anything like her biological father, and just replies ‘a bit' before turning away. Karl sneaks out of bed and begins to gather up a few things, when Izzy stirs. She asks what's wrong, and where he is going, but he replies he is just going to sit up for a bit and clear his head. He tells her to go back to sleep, and she obediently lays back down. Karl asks Max for another beer, but Max thinks he should let that one settle first. Some random punters come laughing into the bar, and wonder where ‘the Scarlet Woman is', which tips Karl over the edge. He attacks them, pushing one of them right onto the bar, until Max unleashes his inner school-principal, and breaks them up, dragging Karl into his office, and apologising to the random, now shaken up, punters. Max slams the door and asks if Karl and Izzy have been fighting again. Understatement of the century, Maxy boy. Max says Izzy has been really fragile lately – if something's going on between them, he wants to know about it. Karl blows up at Max for letting random punters like that into the Bar, but Max doesn't give a rats – and he doesn't think Izzy would have either, they were harmless – he wants to know what's really going on. Karl says Max thought Gus was harmless, and if Izzy looks fragile, it's because she has been through something no woman should have to go through, because of Gus! Susan gives Lance a hug and says it is good to see him. Lance says it is good to see her too, and he is sorry about the divorce. Annalise randomly appears and asks if they could hug again, she missed it. TOADIE: I don't remember giving you an access all areas pass! Susan excuses herself, and Annalise starts questioning Lance. All Toadie wants to do is have a beer with Lance, but Annalise says it is getting interesting – and she wants to know how Lance manages to snare all the gorgeous women – Allana, Carmella….hold on a sec! Rewind! Carmella? Wasn't she Connor's chi…ahh – Annalise is all confused because of the apparently uncanny likeness between Connor and Lance. Annalise points out, despite Toadie saying it is really time for her to go, that it is almost like Lance moved out and Toadie missed his type so much, that Connor moved in. Toadie shoos her out of the house. TOADIE: Crazy broad. Obviously working for the BBC's gone to her head. 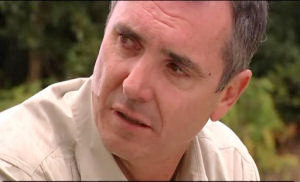 Lance looks at him, and Toadie says he didn't believe her did he? Lance asks how long was he gone before Toadie ‘replaced' him? Steph is nursing Ashley, and trying to get her to smile, and Boyd says if she tickles her feet, that'll do it. Steph jokes that he'll never get any homework done if he sits around staring at cute girls all day. Boyd says sometimes when he looks at her he just freaks out when he thinks how much he loves her – he knows that sounds stupid. Steph says it doesn't, but it'd be good if he could feel that way about Kayla one day. Boyd: Who says I don't? Steph: I'm not judging you Boyd. I'm just saying things would be a lot less difficult if you did. Boyd takes his homework to his room. Max storms in, thanking Boyd for forgetting to take the bins out, and for leaving his mess everywhere. Karl has been thinking – he reckons he and Izzy should leave on their trip sooner than they planned – in fact he is going to see the Travel Agent right now. Izzy says the sooner they get away the better, and Karl couldn't agree more. Susan shakes her head as they have a smooch, and, as Izzy leaves, Karl chases after Susan. KARL: I'm glad I ran into you. SUSAN: Well, that makes one of us. Kayla is telling Ashley how gorgeous she is, because she takes after her Daddy. 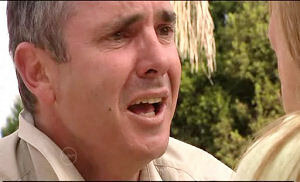 Boyd overhears, and when Kayla realises he is there, she asks how long he was there. Boyd says she still has feelings for Anthony, doesn't she. Kayla points out that she was with him for two years – what does he reckon? Boyd reckons that they don't have much of a chance if Kayla's still in love with another guy. Kayla takes that as Boyd wanting out, but he says he just wants to talk about this – them playing Mum's and Dad's. BOYD: What, are we kidding ourselves? Yeah, pretty much, Boydie. Kayla says she is happy – she really likes him, and she loves the way he is with Ashley. Boyd points out that she is a great kid. But he doesn't know what she's always smiling about – she must know something they don't. Kayla thinks she's just easy to please. Max and Steph come in, and Steph spots Lance. She squeals and hugs him. But Max has other things to worry about besides his wife launching herself at some guy he doesn't even know. He's just spotted Izzy. He asks her what her secret is – why is she so happy? Izzy says things are looking up – she's happy, in love and about to go on a romantic world tour…everything is turning out the way she wanted it! Max grabs her by the arm and pulls her into the office (leaving the door open. That can only be a bad thing…). MAX: Listen. Karl told me about what happened with Gus. MAX: Cut it out, Izzy – it's a lie, isn't it? MAX: You know, it was hard enough finding out that Karl's' baby wasn't his, but to hear this story that you've made up about Gus just to cover yourself? IZZY: How can you say that after everything we've been through? MAX: BECAUSE I'M YOUR BROTHER IZZY! AND IF GUS HAD REALLY DONE THAT TO YOU, YOU WOULD HAVE SCREAMED BLOODY MURDER! YOU KNOW YOU WOULD. Izzy says she did it to protect Karl, because she loves him and….Max says it is crazy. Izzy says she's not proud of it, but she had to lie – it was the only thing she could say to make sure she didn't lose him. Max says she is going to have to tell him. IZZY: No. It was a lie. How can I possibly tell him it was a lie? Lassiters – outside. THE SHOWDOWN!!!!!!!!!!! Karl storms out of Scarlet Bar (Susan and Paul are conveniently sitting outside the General Store), Izzy close behind, and Steph and Max also in pursuit. Izzy is pleading that she loves Karl, and that is all that matters. She grabs his arm, but he pushes her away, knocking her to the ground. Max goes to jump in there, but Steph holds him back. Izzy pleads with him – he can't leave her – he can't! Just watch him, Iz. KARL: You can't tell me what to do anymore. KARL: Isabelle! You only love yourself! I was only ever amusement to you! IZZY: That is not true! KARL: Let me tell you something about yourself. You are the lowest there is! You shift the blame on to a bloke who's not even here to defend himself! Isabelle you make me sick! KARL: You don't get it do you? If Gus weren't dead, I woulda killed him last night, that's how…that's how much I loved you! He runs off, leaving Izzy sobbing, Steph and Max shell-shocked, and Susan staring. Toadie is showing an extremely excited Lance around his Bikini heaven. Lance says Toadie is the luckiest man alive - and he bets the shop earns a packet too. Toadie says actually, it doesn't really, and he might have to shut it down. Lance jumps into action, planning to quit his job, and work there – for no pay! One look at Toadie's face confirms his fears – Connor already works there. Karl is sitting like the broken man he currently is, while Susan and Lyn walk along in the background. Lyn is yabbering on about Izzy/Gus/Karl but Susan doesn't want to talk about it – and she doesn't think it's fair that Karl's friends are gossiping about him behind his back. *splutter* Susan stops dead as she spots Karl, and walks over to him. Lynnie doesn't look too impressed. Susan sits down beside Karl, and hesitantly places her hand on his leg. He looks at her, before taking her hand in both of his, and they exchange a look that says so much more than words could. Just kiss, already! MAX: Oh Steph – she lied to us! And not just once – she looked us in the face, and she lied! I don't know that I'm going to be able to forgive that. Steph just looks sympathetic, as someone knocks at the door. 10 points for guessing who. You got it – it's Izzy. Tearstained, and frazzled. She tells Max she needs to stay for a while – she's got nowhere else to go, he has to help her! MAX: I'm sorry Izzy. You're just going to have to work this one out on your own. He slams the door in her face. Yay! *Ahem* I mean, a sobbing Izzy turns and wheels her luggage back down the driveway to the car. Izzy reaches the car, when she spots Susan. She gives her a smile, but Susan looks her meaningfully in the eye, and, rather symbolically, throws the rubbish bag she is holding in the wheelie bin, and dusts her hands off pointedly. She raises her eyebrows at Izzy, and returns inside, leaving Iz to make her cheeks a little more mascara stained, and wipe her nose on her sleeve.